WHO will uphold the torch of openness in the West? Not America’s next president. Donald Trump, the grievance-mongering Republican nominee, would build a wall on Mexico’s border and rip up trade agreements. Hillary Clinton, the probable winner on November 8th, would be much better on immigration, but she has renounced her former support for ambitious trade deals. Britain, worried about immigrants and globalisation, has voted to march out of the European Union. Angela Merkel flung open Germany’s doors to refugees, then suffered a series of political setbacks. Marine Le Pen, a right-wing populist, is the favourite to win the first round of France’s presidential election next year. In this depressing company of wall-builders, door-slammers and drawbridge-raisers, Canada stands out as a heartening exception. It happily admits more than 300,000 immigrants a year, nearly 1% of its population—a higher proportion than any other big, rich country—and has done so for two decades. Its charismatic prime minister, Justin Trudeau, who has been in office a year, has welcomed some 33,000 Syrian refugees, far more than America has. Bucking the protectionist mood, Canada remains an eager free-trader. It was dismayed by the EU’s struggle to overcome a veto by Walloons on signing a “comprehensive” trade agreement that took seven years to negotiate. Under Mr Trudeau, Canada is trying to make amends for its shameful treatment of indigenous peoples, and is likely to become the first Western country to legalise recreational cannabis on a national level. 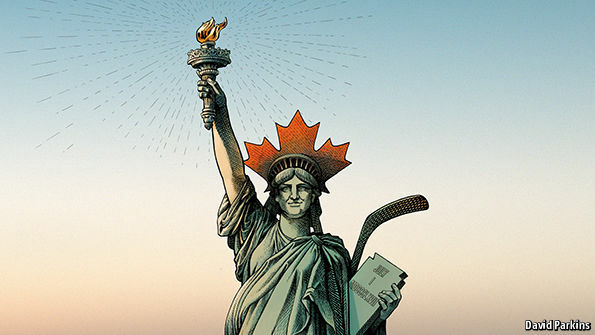 Modern Canada’s social safety net is stronger than America’s; its gun-control laws saner. Today, in its lonely defence of liberal values, Canada seems downright heroic. In an age of seductive extremes, it remains reassuringly level-headed. Many of Canada’s virtues spring from its history and geography and are not readily exportable. It is easier to be relaxed about immigration when your only land border is protected by a wall the size of the United States. Appreciation for the benefits of trade comes more easily to countries next door to big markets. British Brexiteers might justifiably claim that they voted for exactly what Canada already has: control of immigration and the freedom to negotiate trade deals with any country willing to reciprocate. Despite such luck, Canada suffers from some of the stresses that feed populism in other rich countries. It has experienced a decline of manufacturing jobs, stagnant incomes for most of its citizens and rising inequality. It, too, frets about a shrinking middle class. Canadians worry about Islamist terrorism, though the country has so far been spared a big attack. Some right-of-centre politicians, playing on fears that one will happen, indulge in Trumpian rhetoric. Yet Canada does not seem tempted to shut itself off from the world. What can other Western countries learn from its example? First, Canada not only welcomes newcomers but works hard to integrate them. Its charter of rights and freedoms proclaims the country’s “multicultural heritage”. Not every country will fuse diversity and national identity in the same way that Canada does. Indeed, French-speaking Quebec has its own way of interpreting multiculturalism, which gives priority to the province’s distinct culture. But other countries can learn from the spirit of experimentation that Canada brings to helping immigrants find employment and housing. Its system of private sponsorship, in which groups of citizens take responsibility for supporting refugees during their first year, not only helps them adapt but encourages society at large to make them welcome. The UN High Commissioner for Refugees has called on other countries to copy it. The second lesson is the value of knowing when fiscal austerity does more harm than good. Canada has been managing its public finances conservatively for the past 20 years or so. Now in charge of a sluggish economy, Mr Trudeau can afford to give growth a modest lift by spending extra money on infrastructure. His government has given a tax cut to the middle class and raised rates for the highest earners to help pay for it. These economic policies deserve to “go viral”, the head of the IMF has said. Canada has a further economic lesson to impart in how it protects people hurt by globalisation. Compared with America, its publicly financed health system lessens the terror of losing a job; it also provides more financial support and training to people who do. And its policy of “equalisation” gives provincial and local governments the means to maintain public services at a uniform level across the country. Perhaps most important, this mixture of policies—liberal on trade and immigration, activist in shoring up growth and protecting globalisation’s losers—is a reminder that the centrist formula still works, if politicians are willing to champion it. Instead of folding in the face of opposition to liberal policies, Mr Trudeau and his ministers have instead made the case for them. Although free trade is not the hot-button issue in Canada that it is in America, they have been tireless in listening to critics and trying to take their concerns into account. Canada is far from perfect. It remains a poorer, less productive and less innovative economy than America’s. While championing freer international trade, Canada has yet to eliminate obstacles to trade among its provinces. For many liberals, Canada’s emphasis on “peace, order and good government”, enshrined in its constitution, is inadequate without an infusion of American individualism. But for now the world owes Canada gratitude for reminding it of what many people are in danger of forgetting: that tolerance and openness are wellsprings of security and prosperity, not threats to them. ONE of the biggest problems facing America’s economy is waning competition. In the home of free enterprise two-thirds of industries have become more concentrated since the 1990s, partly owing to lots of mergers. 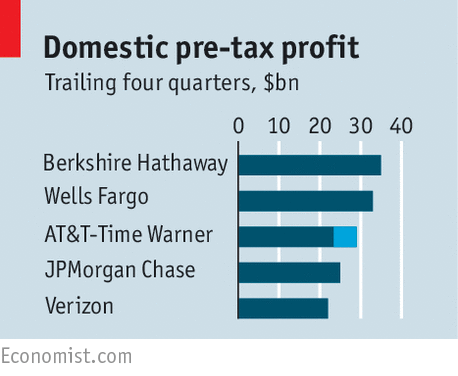 Fat, cosy incumbents hoard cash, invest less, smother new firms that create jobs and keep prices high. They are rotten for the economy. Boosting competition should be a priority for whoever occupies the White House in 2017, and for Congress. Now a test case is waiting in the in-tray. AT&T, America’s fifth-biggest firm by profits, wants to buy Time Warner, the second-biggest media firm. The $109bn megadeal isn’t a simple antitrust case, because it involves a firm buying a supplier, not a competitor. But there is a strong case that it will limit consumer choice in a part of the economy that is rife with rent-seeking and extend a worrying concentration of corporate power. It should be stopped. The business of what Americans watch and how they communicate has seen waves of change. In 1984 AT&T’s national phone monopoly was broken up. In 1990-2010 the rise of the web and mobile phones led to manic dealmaking. Today people are buying fewer bundles of shows from traditional TV firms and instead viewing online, including through Netflix and Amazon. They are watching their phones more and TVs less. AT&T, which makes 80% of its sales from “pipes”—mobile and fixed broadband and voice lines—says it wants to buy Time Warner, which owns HBO and Warner Brothers, among other assets, to bulk up in the media business. Antitrust authorities have recently blocked “horizontal” telecoms mergers, in which a firm seeks to buy a rival. They stopped AT&T from buying T-Mobile in 2011, and Comcast, a broadband firm, from buying TWC in 2015. But they have been easier on “vertical” mergers, in which a firm ties up with a supplier—such as when pipe companies buy content firms. Comcast was allowed to buy NBC Universal, a broadcaster, in 2011, albeit with the condition that it made its content available to all its rivals and kept its pipes open to other content, so that customer choice was not hurt. There are two reasons why trustbusters should now take a tougher line. First, the telecoms industry is already a rent-seekers’ paradise. Americans pay at least 50% more for mobile and broadband service than people in other rich countries. For each dollar invested in infrastructure and spectrum, American operators make 28 cents of operating profit a year, compared with 18 cents for European firms. That reflects the lack of competition. AT&T and Verizon control 70% of the mobile market, and are the only firms that reach 90% or more of Americans with high-speed services. Half of the population has no choice of fixed-broadband supplier. The lack of downstream competition in pipes could distort competition in upstream content. A combined AT&T and Time Warner might seek to limit what any near-captive customers watch, for instance, thus denying other content providers viewers. Safeguards of the sort attached to the Comcast-NBC deal are not much use in practice. One way round them is “zero-rating” plans, in which pipe firms exempt some TV services from people’s monthly data caps, making them more attractive. Another is altering the placement of content in on-screen menus in order to bury rivals’ material. AT&T says this is not its aim, but why else would it pay a $20bn premium for Time Warner? A second concern is that AT&T-Time Warner would have vast political and lobbying power, allowing it to bend rules over time, including any antitrust remedies that it agreed with regulators. It would capture 28% of the media-and-telecoms industry’s pre-tax profits and 2% of all corporate profits, making it America’s third-biggest domestic firm. Media and telecoms regulation is already intensely political, and AT&T today is no shrinking violet, being a vocal opponent of net neutrality, the rules that ensure that all online traffic is treated equally. Precedent suggests that the trustbusters in the Department of Justice (under the auspices of the president), and not the Federal Trade Commission (a creature of Congress), will have the biggest say on the tie-up. This means the deal is being struck just as there is a change of leadership at the top. Those advising on the merger may be gambling that this makes the authorities unlikely to initiate a strong line on vertical mergers. That is all the more reason to be bold. Politicians and regulators may eventually resolve to open up the industry more, for example through “unbundling”, which lets upstart firms use others’ pipes. Until then they should block the AT&T-Time Warner deal and make clear that competition, not consolidation, is the way to get America’s economy working better. DENVER – The Middle East’s tragic tale of two cities – Aleppo in Syria and Mosul in Iraq – speaks to a fundamental lack of consensus in the region and within the broader international community. The lack of order in the international order is greatly complicating the task of bringing these conflicts to an end. When the bloody conflict finally ends in Syria, there will be no victory parades, no moment of national catharsis. More likely than not, what there will be is a political arrangement that leaves Syria within its current borders but with local autonomy that reflects the diversity and – at least for the time being – the mutual distrust of its various ethnic and religious groups. No one will be happy. The accoutrements of a civil state do not exist, and there are no institutions around which to build social consensus or the rule of law. Until these broad principles can be articulated, the war will never be truly over. Ceasefires work best – and hold the longest – when the combatants finally understand that a set of principles agreed by the broader international community will be the basis for shaping the future of their country. The Syrian war is not unprecedented in the region. The Lebanese Civil War was even longer: from 1975 to 1990, that war produced a similar number of casualties and refugees, and when all is said and done, probably a similar number of unsuccessful ceasefires. The Syrian civil war is not yet even half the length of that horrific struggle; but nor is there any sign that the various combatants are fatigued by it. The international community will likely be affected by Syria’s civil war more than it was by Lebanon’s, owing to its greater global impact. The refugee tide was at first contained within the neighborhood, especially in Jordan, Lebanon, Turkey, and even Iraq. But soon refugees began to flow to Europe and elsewhere, causing political tensions in countries far removed from the conflict. The huddled masses of refugees crossing one European frontier after another soon became a metaphor for what angers so many Europeans in this globalized age. The lack of international consensus on Syria, reflected in the failure of the United Nations Security Council’s permanent players to agree on a way forward, has caused the situation on the ground to worsen. Fueled by continued support of the combatants by Middle Eastern states (which seem to have no confidence in the international system), and with Russia’s direct participation in the fighting, the crisis has deepened. Russia’s intervention on behalf of Syrian President Bashar al-Assad has also caused further deterioration in US-Russian relations, which could fuel danger elsewhere in the world. US Secretary of State John Kerry and his Russian counterpart Sergey Lavrov have so far failed to find any workable way forward to end the fighting. One longs for the day that Kerry and Lavrov emerge from a negotiating room to announce to the world that they have agreed on a set of principles that will guide Syria’s future and will work to achieve consensus among other members of the international community and with the combatants themselves. Only when the combatants can envision the post-war future can a ceasefire work. Nobody wants to be the last person to die fighting when the future is already known. In Mosul, the fighting is not a civil war. Unlike in Syria, where there must be tradeoffs among the combatants, in Mosul the struggle against the so-called Islamic State (ISIS) is a war of annihilation. And, in contrast to the Russian and Syrian offensive in Aleppo, the Iraqi Arabs and Kurds and their American advisers most likely worked for months to anticipate issues and to ensure success before the fighting began. But it is already clear that there is far more at stake in the Mosul campaign than the eradication of ISIS. Depending on how it ends, we will know whether Iraq emerges as a multi-sectarian state or a set of sectarian and ethnic enclaves. Sunnis seem to want no part of the Shia-majority government in Baghdad, even though the Iraqi army (along with the Kurds) is playing the largest role in the fight against ISIS. As if the Sunni-Shia divide within Iraq were not difficult enough, a deeper and even more problematic fissure has now emerged – Turkey’s own struggles with its identity and its externally imposed borders. The extraordinarily harmful statement by Turkish President Recep Tayyip Erdoğan that his country has not reconciled itself to its 100-year-old southern border with Iraq’s Ninewa Province has greatly complicated Turkey’s ability to play a role in Iraq’s healing process. Arabs have long harbored deep suspicion that the Turks want more than just to protect the Turkmen minority and Sunni Arabs in the conflict. Now, Erdoğan has confirmed these suspicions, and in so doing has created conditions for more violence in Iraq. How the fighting in Aleppo and Mosul ends will help clarify the tasks ahead. But until Russia, the US, Turkey, Saudi Arabia, and others (Europe, is anyone home?) can come together around a set of principles that steer the region toward peace, the carnage will continue. Nick Giambruno: The US presidential election is only days away. What are the country’s greatest problems right now? Doug Casey: Domestically, I'd say the continual and accelerating loss of freedom, compounded by the prospect of what I suspect will be the biggest financial/economic crisis of modern times. What might that crisis be like? That's unpredictable, although the odds are it will be unlike any others that are still fresh in people's memories, simply because people tend to be most prepared for the things that have most recently scared them. The big problems usually come from an unexpected quarter, and/or at an unexpected time. Like the monetary crisis of 1998 that materialized in Thailand. That said, the question remains of where to look. It could come from outside American borders, in the form of war. War is perhaps the worst thing that can happen, not only for the destruction it will cause in itself, but because it will immensely exacerbate America's domestic problems. As Bourne famously said, "War is the health of the State." Certainly, the US government is actively provoking other governments in a score of places around the world. The next war could be serious, not just a sport war, like those in Iraq and Afghanistan. Nick Giambruno: In 2000, the federal government’s debt was just over $5 trillion. Now, it’s about $20 trillion. It doesn’t matter who’s in power. The debt continues to grow exponentially. Unless the government makes radical cuts to welfare and the military—which won’t happen no matter who is elected—it will grow indefinitely. If Americans are destined to be indebted serfs no matter who’s in power, do the elections even matter? Doug Casey: If the economy goes off of the deep end over the next year—and I think it will—the US government is going to be running much bigger deficits. Spending is going to go up for welfare. Medicare, Medicaid, Social Security—that’s already about two thirds of the US government’s budget. Military spending is also going up. All that is going to go up, regardless of who wins the election on November 8. We could easily see a trillion dollar deficit, perhaps much more. Now, where are they going to get all that money? The Chinese aren’t going to lend it to the US anymore. They’re basically going to finance the deficit by selling the debt to the Federal Reserve. And that means creating more currency units out of thin air. But, on the other hand, the average guy—and for that matter, most businesses—aren’t borrowing money now. They’re too afraid. They don’t want to be in debt. The question is: As this comes to a real climax, are we going to have something resembling a runaway inflation in the dollar? Or are we going to have a massive credit collapse, which could be caused by defaults on bonds, house mortgages, student loans, or auto loans? I’m not sure which is going to happen. I mean, you buy a car now in the US, it costs you what a house did a couple generations ago. It all floats on a sea of debt. I’m just betting on financial chaos. That is the safe bet. No matter which way this election goes, it’s going to be ugly. Both candidates, Trump and Clinton, are disastrous. To me, it’s a sign of how degraded the US has become. About a year ago, they gave us a choice between Hillary, the wife of a previous president, pretty much playing the role of Argentina’s Evita, Juan Peron's brassy wife. And Jeb Bush, the brother of one previous president and the son of another. The US has gone so far downhill that we can only choose which family dynasty we prefer to rule. If only a Kennedy, a Roosevelt, or a Rockefeller could be thrown into the mix as well… Maybe next time. Although I think we’re due for a general or two. Elections are, quite frankly, meaningless. These two corrupt parties, the Republicrats and the Demopublicans, run by political hacks and funded by interest groups, simply appoint the people that they want and then present the American people with the illusion of a choice. The people who run these parties have become increasingly bold and arrogant. They’re absolutely horrible creatures, the same types that used to thrive in the Soviet Union. Americans should be ashamed of themselves for treating them with any respect at all. However, if forced to choose between the two candidates, I would definitely go for Trump, simply because he’s something of an outsider. The media, Hollywood, academia, and the Establishment hate him. And I believe he hates them. If elected, he will likely overturn a lot of apple carts in Washington and break a lot of rice bowls of people who live off the Deep State. That would be an excellent thing. It’s also possible he would retract most of Obama’s Executive Orders, and fire a bunch of supernumeraries. But he might replace them with a bunch of his own. However, it’s clear Trump has all kinds of dangerous authoritarian tendencies—don’t forget his endorsement of torture and the killing of families of accused terrorists as a policy. He also has all kinds of really silly and destructive economic notions—he appears to think he can cut “deals” with foreign governments. That has nothing to do with the concept of free trade. He’s threatened punitive tariffs, something that would immensely aggravate The Greater Depression. Worse, since as a businessman he’s associated with the free market—unfortunately and incorrectly—capitalism will wind up being blamed for this depression as well as a result. Incidentally, I believe—as I have for over a year—that Trump is going to win. Why? It’s not just the immense enthusiasm of his supporters, as opposed to the lukewarm support that Hillary gets. It’s that Bernie Sanders was the other “protest” candidate in this election. His numerous and enthusiastic supporters believe—correctly—that Hillary and the Democratic machine stole the nomination from him. They’re genuinely pissed off. I believe only the most oblivious ones will vote for Hillary. A few might be mad enough to want to burn the house down by voting for Trump. I haven’t heard anyone talking about the absence of the Bernie-istas. I don’t keep my finger on the pulse of the hoi polloi. But, if I’m right, it will result in a landslide for Trump. Unfortunately, Trump is no libertarian—but neither is the dim-bulb candidate of the Libertarian Party. That said Trump is a lot better than Hillary—this is no time for a corrupt, hostile, elderly, debilitated, mildly demented Statist to become president. So, sure, I'd prefer Trump. Am I going to vote for him? I don't believe in being complicit in a criminal act, so I don't vote. 1. Voting in a political election is unethical. The political process is one of institutionalized coercion and force. If you disapprove of those things, then you shouldn't participate in them, even indirectly. 2. Voting compromises your privacy. It gets your name in yet another government computer database. 3. Voting, as well as registering, entails hanging around government offices and dealing with petty bureaucrats. Most people can find something more enjoyable or productive to do with their time. 4. Voting encourages politicians. A vote against one candidate—a major, and quite understandable, reason why most people vote—is always interpreted as a vote for his opponent. And even though you may be voting for the lesser of two evils, the lesser of two evils is still evil. It amounts to giving the candidate a tacit mandate to impose his will on society. 5. Your vote doesn't count. Politicians like to say it counts because it is to their advantage to get everyone into a busybody mode. But, statistically, one vote in scores of millions makes no more difference than a single grain of sand on a beach. That's entirely apart from the fact that officials manifestly do what they want, not what you want, once they are in office. Nick Giambruno: What about voting for the Libertarian Party? Doug Casey: The Libertarian Party once had a claim to being the party of principle, back in the days when people like John Hospers, Harry Browne and Ron Paul were their candidates. Then they for some reason put forward the empty suit Bob Barr, an ex-Congressman. It appears that the Libertarian Party has been captured by the Republicans, which is surprisingly clever on the Republicans’ part. Now they have two parties that are registered in all 50 states. It’s kind of a backup system to the regular Republican Party. They’ll need a backup, since the old GOP is a dead duck. Regarding Gary Johnson, I don’t know what his philosophical beliefs, if any, are. I suspect neither does he. The only thing we really know is that he wants to see pot legalized on a national scale. Well, bravo. I’m all for that, even though I’m not a toker. It’s a step in the right direction toward dismantling the insane War on Some Drugs. But does he have any other libertarian tendencies? He doesn’t seem to even have a grasp of the basic principles… although he seems better than the average politician. But that’s not saying much. I’m especially concerned about his running mate, William Weld, who’s an actual neocon. He’s an overt statist, an active promoter of warfare, welfare, taxes and regulations. He has no libertarian tendencies at all that I’m aware of. He’s a pure Deep State guy. One thing you’ve got to say about the Democratic Party is that, while their ideas are destructive and evil, at least they’re honest about them. Democrats make no bones about being the party of socialism, and they naturally attract the envy driven, the class warriors, the politically correct, the cultural Marxists, the race baiters, the gender Nazis, and the like. The Democratic Party is beyond redemption. It needs to be flushed. It has zero redeeming value. The Republicans attract a different group. Religious people. Cultural traditionalists. People who generally favor what they think is the free market. They tend to be much more nationalistic and pro-military than the Democrats. But, unlike the Dems, the Reps have no real philosophical foundation. The Democrats can be viewed as the evil party and the Republicans as the stupid party. But they’re really just two sides of the same coin, at least when it comes to their leadership—who are all Deep State members. The situation has actually gotten out of control, and the government is so big and so powerful at this point that it can’t be reversed. Even if Ron Paul were elected, it wouldn’t do any good. The first thing that would happen is that he would be sat down with a bunch of generals and heads of Praetorian agencies, like the FBI, the NSA and the CIA, who would inform him—politely, but firmly—how things really work. If he didn’t play by their rules, his life would be at risk. And if for some reason he dodged those bullets, he would be impeached by Congress before he had the chance to actually change anything. And if for some reason that didn’t work, the average American would be out in the street rioting, because his doggy dish was going to be broken. Don’t forget, almost 50% of Americans are net recipients of government benefits. I’m afraid that when the looming crisis blows up, the American people—Boobus Americanus as H. L. Mencken said—is going to clamor for somebody to kiss it all and make it better. We could very well wind up with some type of a military dictatorship. Nick Giambruno: I agree, Doug. I also do not vote. And there are far more powerful ways to vote anyway. You can vote with your money by swapping fiat currency stored in a fractional reserve banking system (like the US dollar) for physical gold and silver. You can also vote with your feet by leaving the country. Instead of voting for a politician, which only creates the illusion of making a difference, those two steps can actually make a positive change in your life. Doug Casey: I agree. The thing is that all of our ancestors—all of us who are Americans—came from foreign countries. Everybody came to America because they wanted to get away from being turned into slaves in their home countries. The problem is that the US government is going in the same direction as those governments that our ancestors ran away from. Now we have to go someplace else ourselves. We have to find a new America. I'm very pleased that I can watch all this nonsense on a widescreen in a coffee shop in Argentina and not be very adversely affected by it. Argentina, incidentally, is now going the right way from many points of view. ace when the natives get restless. Ask Russians in the 20’s, Germans in the 30’s, any European in the 40’s, Chinese in the 50’s, Cubans in the 60’s, Vietnamese in the 70’s, Rhodesians in the 80’s—or Venezuelans today. And that’s just an incomplete list off the top of my head. It’s especially risky if you have some assets during real economic upset, or ideas that aren’t mainstream when there’s real political turbulence. Nick Giambruno: Most Americans are effectively stuck in the US. So, looking at these disturbing socio-political trends, what else could happen? Doug Casey: It's amazing, and disturbing, that most of the young people in the US support Bernie, an avowed socialist, whose ideas are, if anything, worse than Hillary’s. But it just shows how unhappy young people are with the status quo. Justifiably unhappy. Bernie and Trump hit the same nerve—they sensed that we're on the edge of a revolution in this country. We really are. The situation is not unlike that before the War Between the States, very unstable. Both sides are extremely antagonistic. People either hate Trump or they hate Hillary. It doesn’t matter who wins; the other side is going to be very, very unhappy. And with tensions already running high in the country, and racial, cultural and social clashes in the background, it almost feels like a civil war is in the cards for the US. Of course, it seemed like we could have had a civil war back in the late 60’s and early 70’s, when there were not just a few, but thousands of bombings. Not just little riots, like in Ferguson and Baltimore, but conflagrations like in Watts, DC, and Detroit, where the National Guard was raking the ghetto with .50 cals. But the country’s prosperity was still increasing in those days. Now we’re on the cusp of The Greater Depression. Things could get ugly. Contrary to what most believe, the US hasn’t had a real civil war yet. The unpleasantness of 1861–65 was actually a war of secession. A civil war is one where two or more groups are vying for the control of the same government, as in Spain during the 30’s, between the fascists and the communists. But this time in the US it could turn into a real civil war. I don't know what form it would take, but a lot of things could be really tough going: economically, financially, politically, socially, militarily. Most important, there’s a cultural divide that’s arisen in the US. I don’t think most people are even aware of what is going on. When you walk outside, the sun is shining. Children are still playing. You can go down to the Wal-Mart and buy cheap goods. Everything looks pretty good on the surface, despite the fact everyone’s credit card is maxed out. But I think it’s all a hologram that’s about to be exposed. So, hold on to your hat. Chinese president Xi Jinping has been anointed as the “core” leader of the Communist party, paving the way for a return to strongman rule after a decade and a half of consensus leadership among the country’s elite. The designation as “core” of the party is a break from recent practice and elevates Mr Xi to a level of individual power last bestowed on Jiang Zemin, in the immediate aftermath of the 1989 crackdown on the Tiananmen Square protests. Mr Jiang headed the party until 2002 and continues to exert influence from behind the scenes without any formal title. The conclusion of the party plenum on Thursday kicks off a year of political horse-trading as Mr Xi, who is also chief of the military, attempts to cement his power in his second term and beyond. The make-up of the Standing Committee of the politburo will be announced next autumn at the Communist party congress. “Gaining the core leader status certainly implies Xi is more powerful than before the plenum and more powerful than his two predecessors [Jiang Zemin and Hu Jintao] at the same stage of leadership. But that was the case even before he gained this new status,” said Steve Tsang, a Sinologist at Nottingham University. The proposal to designate Mr Xi as the “core” of the party generated deep opposition when it was first floated earlier this year. Many in the party and the broader public argue that China can only be effectively governed by an authoritarian leader. But others fear a return to the irrational rule, restrictions on individual liberty and economic stagnation that accompanied the Communist party’s extreme consolidation of power under chairman Mao Zedong in the 1950s and 1960s. In a front-page article this week the People’s Daily, which reflects the official views of the party, described a threat to China equivalent to the fall of the Soviet Union if the party did not unite. It engaged in unusually lengthy praise of the decades when chairman Mao Zedong exerted such sway that “even the ‘dida dida’ cadence of his voice through the radio was enough that all cadres obeyed unconditionally”. “The secret, the key of the Chinese Communist party, is that it can make use of its strict internal political life to achieve party unity, unify the will inside the party and turn that will into the will of the state — even if it’s only the simple sound of ‘dida dida’,” the newspaper said. The plenum also marked a shift in party rhetoric from “anti-corruption” to “discipline”, amid frustration that an almost four-year purge of the party leadership and military brass has failed to yield the promised efficiency. Mr Xi’s problem as he tries to cement his own succession is that he has only a handful of loyalists who have the requisite age and experience. Consolidating his own power as the “core” of the party shatters the power-sharing arrangement among party elders, first adopted by economic reformist Deng Xiaoping and ingrained during the generation of leadership under Hu Jintao. It has kept China politically stable in recent decades but is also blamed for corruption, inefficiency and bureaucratic resistance to Beijing’s priorities. The “core” idea was so controversial when it was first floated early in 2016 that it prompted unusually public opposition. 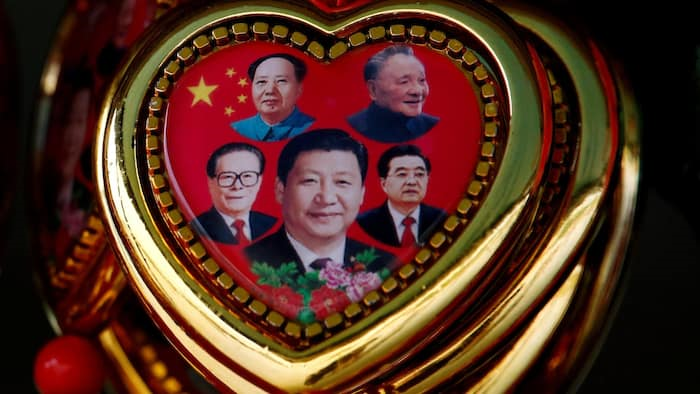 About 20 provincial party chiefs quickly hailed Mr Xi as the “core” of the party but the designation was pointedly not repeated at the time by his most senior colleagues, the six other members of the Politburo Standing Committee. Since then, months of political manoeuvring, promotions and punishments have shifted the balance in his favor. “Change has got to come” said the UK prime minister in her recent conference speech. She was making an unexpected foray into monetary policy. She criticised the idea of creating more money and driving rates down lower. She reminded us that this helps the rich who own bonds and shares, but hits the modest saver who gets very little reward for holding deposits and savings bonds. It makes it dearer for people with no wealth to buy a property or other assets, with big consequences between the generations. Her speech came after the event of the Bank of England driving rates down lower and buying more bonds, one month after the referendum. It did this despite the acceleration of money and credit that was occurring naturally without further central bank stimulus. The decision meant the pound was pushed down further and inflation was raised as a result. Why? The BoE said this action was needed to offset a possible fall in confidence. Some large companies remain concerned about future investment, but consumer confidence — the biggest part of the economy — was holding up well. Perhaps the BoE will think again and not press ahead with a further rate cut and more quantitative easing. World bonds generally are sustained by all this official buying. Recently, I was speaking to an investor who complained that the return on their deposits was derisory. I pointed out that their portfolio had risen in value by more than 10 per cent this year alone, as they were in the fortunate position of having wealth held in bonds and shares. Monetary policy has looked after the rich more than the small saver. It has also been very kind to the FT fund. The fund continues to do well, with a return of 14 per cent for the year so far. UK assets have done well since the Brexit vote sell-off, reaching new highs, and Asian assets have had a good year. Given the global background of modest growth and plenty of competition chipping away at prices and margins, my mind has turned to locking in some of the gains. The FT fund, like other balanced investment funds, has enjoyed a bonus on its overseas investments from the fall in sterling which has boosted the performance of exchange traded funds. It is unlikely the bear raiders of the pound have finished yet, though there are now record levels of shorting. We know from past experience that currencies can overshoot when the market gets a mind to drive them one way or the other. We also know that late speculators to join a bear raid can lose a lot of money. I decided to take the profit of 30 per cent on the FT fund’s holding in Korea (MSCI Korea ETF). The news from Samsung is unhelpful. While the damage has been done to just one of their phone products, it will take time for the company to rebuild its brand and reassure present and future customers. Samsung is around one quarter of the South Korean index, and an important standard bearer for corporate Korea generally. Similarly, when Volkswagen fell into difficulties with its diesel engines that acted as a further damper on the German market (which had been falling before the announcement). I also took good profits on the FTSE 100 which I bought immediately after the referendum on the big markdown on the result. The market soon rose to new highs, shrugging off the vote. I have put the money from these sales into a general world shares fund for the time being, as this should be less volatile. It also allows me to buy an ETF which offers currency protection. The sharp falls in the pound have taken the UK currency down to very competitive levels. At some point you would think the UK authorities will want to say or do something that stabilises the currency. They have been very tolerant so far of massive short positions against sterling. Their narrative has both predicted it and expressed a relaxed attitude to it. While a bit of devaluation may help make a country more competitive, too much of it becomes inflationary and eventually requires the response of higher interest rates. There may be another downwards push by the speculators. There could also be at any time a sharp upwards correction, when sterling bears worry they could start to lose money on their extended short positions and rush to close them. Portfolio management is about a balance of risks, where taking profits on a good investment decision locks in an advantage whatever happens next to the asset you are selling. It is true you need to be careful with what you then do with the money. The fund had a lot in foreign currencies, so I think it is time to cut back on that risk. As we expected, the UK economy has held up well this year, and is now forecast by the IMF to be the fastest-growing of the major economies. Money and credit growth has been good. The rate of job creation has been satisfactory, and property has performed well. The surveyors and economic pundits expected a sharp collapse in confidence and a fall in commercial and residential property prices. They are now revising their forecasts upwards again. The news from the housebuilders is positive, with rising levels of interest and reservations. Most are reinstating their plans for 10-15 per cent growth in output. House prices have not fallen. Commercial property remains well bid both by people wishing to be tenants and by buyers of buildings. The stock market has discounted this brighter outlook, hitting new highs. Many domestic buyers and tenants need new or extra space and are pressing ahead with their plans. Foreign investors now have the opportunity to buy UK property and other assets at bargain levels thanks to sterling. No wonder the property market has defied the gravity of pessimistic valuers.